Over the past 12 years I have repeatedly visited Jerusalem’s City of David, often as frequently as 5 or 6 times each year. I have extensively studied the mountain on which it is located and continue to do so. I am fascinated by the evolving nature of discovery as excavations, especially at my favorite site, the oldest on the mountain continue to reveal amazing secrets of its past. I have come to experience, through a review of Jewish history as influenced by archaeology that my imaginative realization is increasingly complete. Notwithstanding departures from varying opinions, I find myself defending the past from distortion. Perhaps my ambition deters me, but I am compelled by a certain responsibility to push forward regardless. ...R’ Yosi haGalili said ‘when Israel entered the Red Sea, mount Moriah was already uprooted from its place with Yitchak's altar built upon it and its woodpile in place. Israel's historical record is replete with fiendish enemies who sought the nation's destruction. Laban, the father in law of Israel’s progenitor Jacob was intent on usurping his future national heritage. On Israel’s exile in Egypt, Pharaoh and his occultist advisors were alarmed at their record population growth and the ethnic cleansing that followed is made abundantly clear. After leaving Egypt following some impressive early war victories Israel amassed on the east bank of the Jordan. The opposing sentiment of the seven Canaanite clans who had occupied Israel’s land was well established. Israel had risen and was coming back to reclaim its land, eternal cities and Jerusalem! By the time Moses sent his select men to explore the land Israel was expecting to enter, the fortified walls surrounding ancient Jerusalem and at the Gihon Spring, its water source had already been constructed. Some of Moses men complained of massive towers, walls and giants that saw them as mere insects. Indeed having spent a few years wandering the desert, the imposing construction would have been daunting. On the scale of pyramids, the stacked one tonne boulders rose 50 meters from the valley floor, up the steep incline to meet the reinforced stone walls that surrounded the city on the summit of the ridge. Although the seemingly impenetrable fortress at the Gihon Spring had deflated the report of the explorers, the archaeology reveals it did not protect the water, which flowed freely into the valley floor. 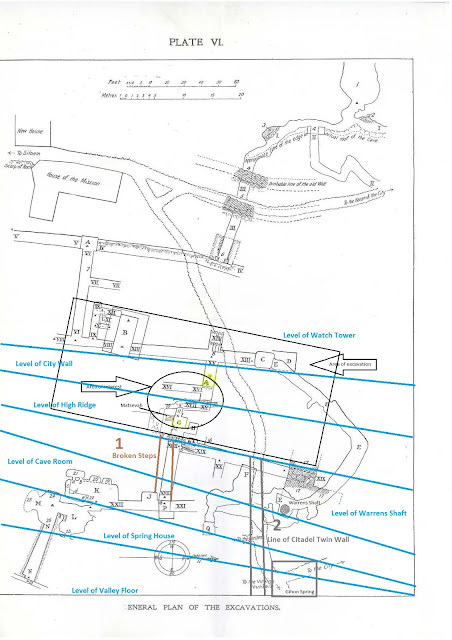 Perhaps the fortress protected city folks while they accessed water, but it’s grand scale, specific location, offset to the south of the spring and relativity to other important artifacts on the High Ridge establish a serious intellectual and academic challenge. Why was it built? To understand this we must briefly consider occultist opposition to Israel through the competitive progeny of Abraham’s father Terah, descendant of Noah’s son Shem. The principal occultists included Og, Laban and Balaam who through Egypt’s Pharaoh (descendant of Noah’s son Ham) and the Moabite king - Balak, cast their influence far and wide. Their astrological skills were extraordinary, Balaam was considered a prophet of the highest order, even beyond Moses. Abraham and Sarah were fathered by Terah to different wives; Pharaoh fathered Hagar who became Abraham’s second wife; Laban Abraham’s great nephew; Og became Abraham’s right hand man, but later he or his reincarnate rebelled. Balaam, Laban’s reincarnate; and Balak descended from Moses father-in-law, but rebelled to unite Midian and Moab against Israel. Ham’s son Canaan was cursed by Noah and the seven sons of Canaan had occupied most of the land to which Israel was returning. However, if Israel had only one nemesis it was Amalek the nation God commanded them to destroy including women, children and cattle. The Zohar, Israel’s seminal mystical work attributes Balaam and Balak as the principal proponents for motivating the nation - Amalek. Hatred of Israel was palpable among the member nations of occultist rhetoric. Inevitably Israel’s rising through their holy disposition, miraculous events and motivation to reoccupy their inherited land caused these opponents to strengthen their resolve. Israel’s most holy site, the place Shem-Melchizedek, Abraham, Isaac and Jacob connected to their future progeny was considered to be their source of power and the permanent location of Israel’s future temple in Jerusalem. It’s no wonder Israel’s nemesis co-conspirators wanted to stop them and they acted by encasing the eastern slope of Mount Moriah in a mausoleum of massive boulders. The archaeology at the Gihon spans Chalcolithic through Iron age and is highly concentrated. I adapted Parker’s map below to highlight each of the layers ascending from the valley floor up the eastern face of Mount Moriah to the structures on the High Ridge. The double grey ‘Line of the Citadel Twin Wall’ (Area 2) on the map above can be seen in point of view from the photo (below) where Eli Shukron is standing at around 20 meters above the valley floor. Behind him (right of image) is the Gihon Spring House. The distant light in the far background emanates a further 30 meters from the top of the High Ridge. On the left and right (north) remnants of the wall scattered over the bedrock, up to the High Ridge and down to the valley floor, where its foundations remain intact. Dating significant constructions, the map distinguishes between area 1 and 2 that roughly divide in half. Area 1 is arguably the oldest location on the mountain, the rudimentary Cave Room marked ‘K’ dates to the Early Bronze Age perhaps as old as 5000 years. The deep cut tunnel marked ‘E’ descends into the bedrock below ground ‘Levels’ as marked on the map, it can be attributed to a similar time and may have originated as part of the artesian aquifer on mountain. The area, rooms and artifacts on the High Ridge marked ‘G’ are dated to the middle or late bronze age around 4000-3800 years. Large cut boulders in Area 1 marked “Broken Steps” that once connected the High Ridge (‘G’) to the Upper Gihon Pool below ‘P’ were purposefully destroyed as indicated by the order of their fall. Area 2 is later, more sophisticated dated to around 3700 years including construction of the Citadel Twin Wall. Notwithstanding the theory of purposeful destruction, surprisingly some of the most sensitive artifacts on the High Ridge were well preserved. The preservation seems to have been facilitated by rock/wall fill discovered between and separating the rooms of area ‘G’ from the point the Citadel Twin Wall meets the High Ridge. This fits with the theory of division of areas 1 from 2. Further passage between the Twin Walls from the High Ridge was discovered to its north, just before the steep tunnel descent at the second ‘E’ (from top) on the map. Given the Broken Steps and preservation of artifacts on the High Ridge, it appears there was a concerted effort to disconnect the lower levels of area 2 from the High Ridge. We cannot be certain of the time of this separation, but we can be more certain that the Twin Walls were constructed in part to conceal or divert traffic away from the previously constructed High Ridge and its artifacts. The High Ridge may have once been used extensively for worship, but by the time the Twin Wall abutting the surrounding city wall was constructed, city folks in the area no longer used it or its use was forbidden. If this theory is correct then no artifacts from periods later than ~3700 are unlikely to be discovered around ‘G’ on the bedrock of the High Ridge. If use and access to the High Ridge were not permitted, it would add further support the theory and evidence that the influence of Israel and its monotheistic practices were being locked out, buried and its holiest site permanently altered. Lead Archaeologist, Eli Shukron noted the packed, soft earth discovered around the rooms on the High Ridge, including ‘G’ appeared to support continued preservation at some time in the post first temple era. The Twin Wall construction abandoned area ‘G’ on the High Ridge. Once a regularly used holy site was locked outside the city wall and the external, inaccessible south face of the Twin Wall - red line in image above. Access through the Twin Wall was contained to the middle passage. 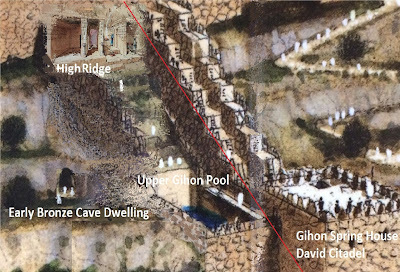 On the valley floor, the previously constructed Upper Gihon Pool could be used, but the steps that one led from the pool to the High Ridge had been broken to disconnect people of the city and anyone who dared attempt the climb. This important site on the east face of Mount Moriah contains artifacts for holy Jewish Temple worship, but the only temple ever referred at this site and in this time, could be the Beit El (House of God) that Jacob once dedicated to fulfill his covenant. We must struggle with the prospect that the first temple of Solomon and the second of Zerubbabel, Ezra and Nehemiah were built in a different location on the mountain.